Hypertension is the most common cardiovascular disease experienced by many. It is caused by unhealthy lifestyle, and occurs when the arteries experience high pressure on the artery walls. One of the best natural treatments for this ailment is garlic. It can lower blood pressure and improve a person’s health. So, how does garlic work and why is it good for hypertension patients? The best thing about garlic is its ability to alleviate blood and cholesterol-related diseases including hypertension. HDL or High Density Lipoprotein is said to be the good cholesterol of the body. It travels through the bloodstream and eliminates all the bad cholesterol in the blood. If you have higher level of HDL in your body, lesser risks for you of getting any heart ailment. Researches show that feeding on garlic extract is an effective source of HDL. This means that patients diagnosed with hypertension can greatly benefit from garlic and lessen the chances of breakdown. Controlling the body’s Epithelial Sodium Channel or ENaC is highly essential for people with hypertension, especially those with salt induced conditions. Since the ENaC is the main portion where the body would reabsorb the salt, hyperactivity of this part can lead to high blood pressure. In relation to this, many researches have been made about regulation of ENaC which may eventually lead to the prevention of hypertension. And one of the outcomes pointed on the abilities of garlic to control the ENaC. Recent studies confirmed that the compounds found in garlic extracts can effectively stop the hyperactivity of the channel. 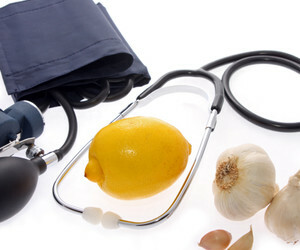 It just shows that garlic can vitally help in alleviating high blood pressure and hypertension.